Gateway of India is a historical monument located in Mumbai. It is located in the Colaba area of South Mumbai. It is a very famous tourist destination and it is visited by almost every tourist who came Mumbai for sightseeing. This historical monument is a good architectural building and it is famous worldwide. 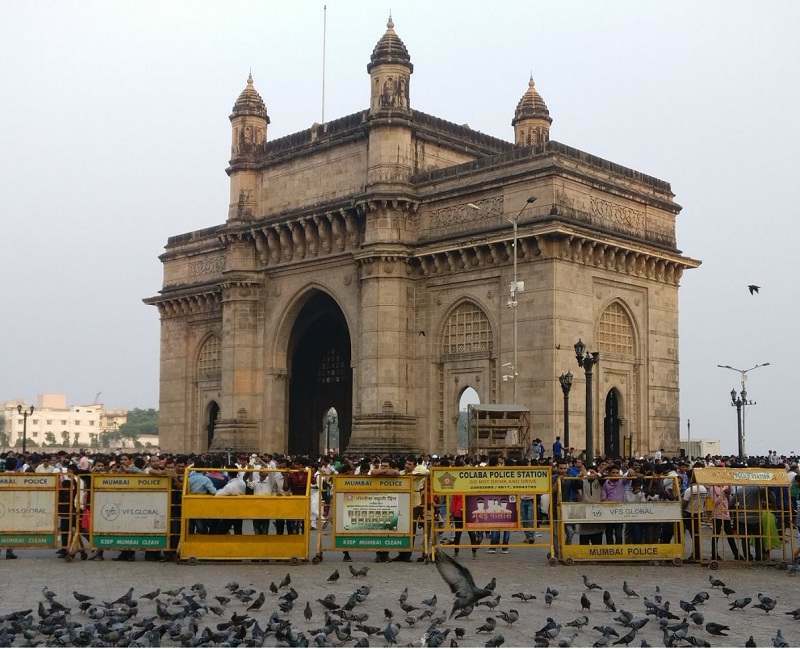 We are sharing the timings of Gateway of India along with entry fee, location and how to reach here. As the name suggests, it was served as entry and exit gate of India during British regime for the viceroy, Governors who came to that time Bombay. Foundation stone of this monument was laid on 31 March 1911 and construction was started on 31 March 1913. It took almost 11 years in the construction of the monument and it was completed on 4 December 1924. The cost of the project was 21 less in 1913. George Wittet was the main architect of the gate and it was built in the Indo-Saracenic Architectural style.The diameter of the gate is 49 feet and it is 85 feet high. Archaeological Survey of India is the current owner of this historical monument. It is located in the Colaba area of Mumbai. The Taj Mahal Palace Hotel is located opposite to the gate. These two are the most famous landmark of Mumbai city. This place is well connected with every part of the city and it is accessible by multiple transport mode. Auto rickshaw, private taxi, best buses can drop you here. Apart from that you can reach here via the local trains also, the Chhatrapati Shivaji Terminus station and Churchgate station are the nearest station to Gateway of India, both are under 2.5 KM from here. It opens 24 hours for the public and can be visited by the visitors at any time of the day. Entry is completely free for everyone. The camera is also allowed here without paying any extra charges. It is located in the big area and at least 1 hours is required to see this monument from each angle. Afternoons of Mumbai are very hot and humid, therefore, post afternoon (4 PM) time is good to visit this place due to pleasant weather. If you are planning to visit this place in the noon time, kindly carry a water bottle and sunglasses along with you. View of the ocean is very good about this place and walk along with the coastline is recommended in the evening time to feel the cool breeze of the ocean. At the evening time it got very crowded and visitors can also visit this place, in this morning time also to avoid the crowd. The night is also a good time to visit the place and see the gateway of India under the lights. If you are planning to visit this place in the night, I suggest to you to reach here at the time of sunset, so that you can enjoy the evening and night visit in one visit. Shades and benches are not available here. Feery Ride at Gateway of India provides an unforgettable experience and during the visit of this monument, visitors should take this ride. These ferries provide a short ride in the sea and provides an amazing view of the Gateway of India. Most of the ferries are double Decker and timing of first ferry is 9 AM and they close before the sunset. Lower deck and upper deck tickets can be purchased. Upper deck ticket prices are generally costlier than the lower deck and upper decks are recommended due to better view of the Gateway of India. As it is located near the Taj hotel of Mumbai, tourist gather from all the Mumbai to see both the monuments. Security is very good and friendly here. Rickshaws are banned in this area during my last visit and parking space is very limited. I suggest you to visit this place by public transport or you can park your vehicle in the nearby hotel’s parking. No food joint are available inside the gateway complex, however, food joints, hawker and street food vendor are available in the vicinity. This place is good for photography to click multiple pictures. You can get good quality pictures here by paying a nominal charge of 30 Rs for one copy of the image. Multiple photographers are roaming here, they click and print photo instantly in nominal price. Here you will find many pigeons along with the beautiful view of Arabian sea. A gateway bazaar is setup here besides the footpath of Gateway of India. Here you can find a woman and man clothes, key rings, souvenirs, etc. Always try to bargain here with the vendors for the best price. Generally they quote twice or thrice price of the product.